Downtown again today meeting my brother for lunch, so here is another Boston shot. Inspired by Michael Avina's photo from Day 43, I've been looking for an opportunity to play around with shooting perspective, and this is what I came up with. 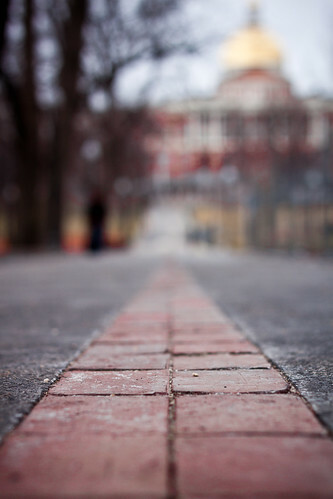 The Freedom Trail is a red brick path through downtown Boston that leads to many significant historical sites in the city. It is very popular with tourists, but on this wintry February afternoon not many people were around. ¹⁄₅₀₀ sec at f/3.2, ISO100, no flash.